A popular trend this spring for décor is flowering branches. 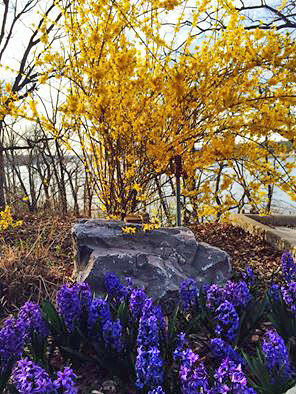 One of my favorites is the forsythia with its bright yellow flowers. Here are a few ways to use forsythia branches to welcome family and friends to your home this Easter and celebrate the spring season. Welcome guests with a wreath in spring colors. Here a few branches of forsythia artfully circle a curly willow wreath decorated with happy pops of pink spray roses, succulents, kale and yellow craspedia. Another delightful way to welcome guests is with a floral showpiece in the foyer. Here forsythia branches in a tall cylinder vase tower above the spring wreath. Forsythia also look lovely in floral arrangements. If you’re invited to an Easter gathering, have your local florist deliver the flowers straight to the host’s house, so the flowers are there for the start of the celebration. You’ll get such a warm welcome! Send a spring arrangement like this one featuring blue hydrangea, purple iris, pink tulips, and bright yellow forsythia and roses. If you’re decorating for your own Easter brunch, consider several spring floral vases like this one lined down the center of your table for a colorful table scape. How are you decorating for Easter?